The world is a colorful place and there are many cities around the world famous for its colorful nature along with many of the world's most prestigious metropolis huge skyscrapers and luminous glass-and-steel facades its unique architecture And attracting tourists due to their roads painted houses. Here is a list of those colorful cities each is alive in its own unique way. All of you should have an eye on everyone from Jodhpur in India or Havana from candy to blue-colored houses to buildings many urban areas have painted vivid colors in their streets for generations. Just do not forget to pack your sunglasses and get out to visit these bright cities! Burano is an island in the Northern Italy and it is known for its work and brightly coloured homes. The colours of the houses follow a specific system originating from the golden age of its development. If one wishes to paint one's home he/she must send a request to the government. La Boca Buenos Aires Argentina: La Boca in Argentina is a popular destination for tourists because of its colourful streets and houses. Among sports fans Boca is best known for being the home of world famous football club Boca Juniors. Menton is a village in the Southeastern France with beautiful and painted houses alongside the beaches. It can be considered as one of the best places to visit and relax. Brighton is a suburb of Melbourne Australia. Dendy Street Beach just south of Middle Brighton features 82 colourful bathing boxes which are one of the tourist icons of Melbourne. Jodhpur India: Jodhpur is also known as 'Sun city'. Jodhpur is a city in the Thar Desert of the northwest Indian state of Rajasthan. Its 15th-century Mehrangarh Fort is a former palace that’s now a museum displaying weapons paintings and elaborate royal palanquins (sedan chairs). Set on on a rocky outcrop the fort overlooks the walled city It is widely famous for its painted houses. This city is surfaced with different shades of colours like purple blue and pink. If the La Boca neighborhood of Buenos Aires reminds you of Europe you're on the right track - many of its early settlers came from Genoa Italy. Take in the many colorful houses of Venice during a gondola ride! If you think Venice is too crowded or touristy try one of the nearby islands like Burano. Gary H. took this photo during his Azamara cruise. In the mood for shopping? Burano is known for its beautiful lace and the nearby island of Murano for its Venetian glass. Nyhavn is a 17th-century waterfront canal and entertainment hub in Copenhagen. Thanks to its historical wooden ships and brightly colored townhouses bars cafes and restaurants it is a fun (and photogenic!) place to visit. 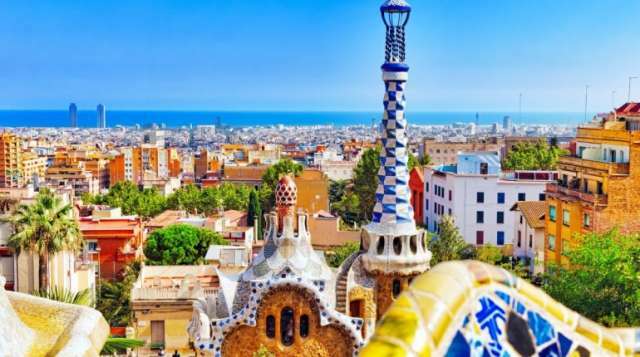 Park Güell is one of the most recognizable sites in Barcelona. Designed by Catalan architect Antoni Gaudi in the early 1900s the complex park is one of the largest architectural works in Southern Europe. The colorful "Works of Antoni Gaudi" is a UNESCO World Heritage Site. Santorini may be known for its whitewashed villages but bright blue roofs and pink orange and yellow pops of color have landed it on our list. Make a stop in the village of Oia during one of these Greek Islands cruises. Puerto Vallarta's architecture is as vibrant as its nightlife. This resort town boasts legendary beaches award-winning restaurants and bustling bars. This Baltic port is a favorite of many Azamara cruisers. Once you see it you'll understand why - the quaint port appears to be straight from the pages of a fairytale. Vanessa J. took this colorful photo during her Spring cruise on the Azamara Journey. When it comes to some cities you simply must see them at night. Singapore is one of those cities. Azamara guest Larry K. shared this photo with us and it perfectly captures the vivid colors of Chania. One of the Flegrean Islands off the coast of Naples in southern Italy. The island is between Cape Miseno and the island of Ischia. San Francisco in northern California is a city on the tip of a peninsula surrounded by the Pacific Ocean and San Francisco Bay. It’s known for its hilly landscape year-round fog iconic Golden Gate Bridge cable cars and colorful Victorian houses. Formally known as Pachuca de Soto is the capital and largest city of the Mexican state of Hidalgo. The city occupies a small valley and is almost completely surrounded by large hills which are also covered in housing. Pachuca is center of one of the most important mining areas in Mexico and for this reason most of the city’s attractions are based on the mining industry. The Reloj Monumental—Monumental Clock is the icon of the city. Donated by Cornishman Francis Rule it was built to commemorate the Centennial of Mexico’s Independence and was inaugurated on 15 September 1910 (Noche de Grito) . The Asunción Church is the oldest in the city constructed in 1553 and remodeled several times. Buenos Aires Argentina’s big cosmopolitan capital is known for its European atmosphere passionate tango and vibrant nightlife. Its center is the 16th-century Plaza de Mayo lined with stately buildings including Casa Rosada the iconic balconied presidential palace. In Microcentro Florida Street is the main shopping thoroughfare leading to Plaza San Martín a busy park that was once the site of a bullfighting arena. A town and municipality in Antioquia Department Colombia. This quaint town is the gathering place for “Las Vegas” or the small farms of the area. It is also a growing area of recreation for citizens of Medellín and aims to be a tourist destination for foreign travellers. New resorts several restaurants and rental homes along the lake are available for visitors. Each building has tiles along the facade’s lower walls in bright colors and dimensioned images. Many of the tiles are tied to the products sold by the shops or the beliefs of the residents. Others are cultural images of the farming heritage of the community. Copenhagen Denmark’s capital sits on the coastal islands of Zealand and Amager linked to Malmo in southern Sweden by the Öresund Bridge. Indre By the central district contains 18th-century rococo Frederiksstaden home to the royal family’s Amalienborg Palace. The city’s center also has the Christiansborg parliament building and the Renaissance Rosenborg Castle which has a museum of royal artifacts and a popular garden. The Bo-Kaap is an area of Cape Town South Africa formerly known as the Malay Quarter. It is a former township situated on the slopes of Signal Hill above the city centre and is an historical centre of Cape Malay culture in Cape Town. Charleston the South Carolina city is defined by its cobblestone streets horse-drawn carriages and pastel pre-Civil-War-era houses particularly in the bustling French Quarter and Battery areas. The Battery promenade and Waterfront Park both overlook Charleston Harbor while Fort Sumter a Federal stronghold where the first shots of the Civil War rang out lies across the water. Founded by Transylvanian Saxons during the 12th century Sighisoara still stands as one of the most beautiful and best-preserved medieval towns in Europe. Designated as a World Heritage Site by UNESCO this perfectly intact 16th century gem with nine towers cobbled streets burgher houses and ornate churches rivals the historic streets of Old Prague or Vienna for atmospheric magic. It is also the birthplace of Vlad Dracula also known as Vlad the Impaler ruler of the province of Walachia from 1456 to 1462. It was he who inspired Bram Stoker’s fictional creation Count Dracula. St. John’s a city on Newfoundland island off Canada’s Atlantic coast is the capital of Newfoundland and Labrador province. Its harbour settled by the British in the 1600s is enclosed by rugged hills. Downtown is known for its colourful row houses. Above the city is Signal Hill which features walking trails and Cabot Tower site of the first transatlantic wireless communication in 1901. The lively capital of Curacao is a welcoming upbeat destination with two distinct historic districts divided by the lovely St. Anna Bay. Punda site of neat narrow streets is crammed with shops and museums. Otrobanda or “The Other Side” is a maze of twisting residential streets contrasting with the organized grid across the bay. Willemstad’s colorful colonial architecture has won it UNESCO Heritage site designations. Diving and swimming with dolphins are popular activities in the bay. Valparaíso is a port city on Chile’s coast. It’s known for its steep funiculars and colorful clifftop homes. La Sebastiana the quirky former residence of Chilean poet Pablo Neruda is now a museum with far-reaching Pacific views. During the 19th century an influx of European immigrants left their mark on the city’s architecture and cultural institutions many of which congregate around downtown’s Plaza Sotomayor. Best known for its Festival Cervantino an arts festival that draws attendance from around the world Guanajuato is also a UNESCO World Heritage Site. Its old town dates back to the 16th century and you can visit many of Mexico’s important religious and artistic sites. Guanajuato was also home to the Mexican independence movement and the site of the first failed rebellion against colonial rule. Salvador a city in Brazil’s northeastern state of Bahia is known for its Portuguese colonial architecture Afro-Brazilian culture and tropical coastline. The Pelourinho neighborhood is its historic heart with cobblestone alleys opening onto large squares colorful buildings and baroque churches such as São Francisco featuring gilt woodwork. Capoeira martial artists and Olodum drummers perform on the winding streets. One of the largest and best preserved medieval city centers in Europe and one of the foremost attractions in Stockholm. There are several beautiful churches and museums in Gamla Stan including Sweden’s national cathedral Stockholm Cathedral and the Nobel Museum. The largest of the attractions in the district is the Royal Palace one of the largest palaces in the world with over 600 rooms. Jodhpur is a city in the Thar Desert of the northwest Indian state of Rajasthan. Its 15th-century Mehrangarh Fort is a former palace that’s now a museum displaying weapons paintings and elaborate royal palanquins (sedan chairs). Set on on a rocky outcrop the fort overlooks the walled city where many buildings are painted the city’s iconic shade of blue. Puerto Vallarta is a resort town on Mexico’s Pacific coast known for its beaches water sports and robust nightlife scene. Its historic cobblestoned center is home to the ornate church Nuestra Señora de Guadalupe boutiques and a wide range of restaurants and bars. El Malecón a beachside promenade with contemporary sculptures as well as bars lounges and nightclubs becomes lively in the evenings. Tirana the capital of Albania is known for its colorful Ottoman- Fascist- and Soviet-era architecture. Pastel buildings surround the city’s focal point Skanderbeg Square which is named for its equestrian statue of a national hero. On the square’s north end is the modernist National History Museum covering prehistoric times through Communist rule and the anti-Communist uprisings of the 1990s. Longyearbyen is the largest settlement and the administrative centreof Svalbard Norway. Traditionally Longyearbyen was a company town but most mining operations have moved to Sveagruva since the 1990s while the town has seen a large increase in tourism and research. A city trapped in time Havana captures the imagination like no other. Faded glamour meets careful colonial-era reconstruction with a backdrop of irresistible color. Walk El Malecón the walkway bordering the ocean; visit Old Havana and the Catedral de San Cristóbal; and listen for salsa music open-air bazaars and parties that last all night. Surprisingly Wroclaw is Poland’s fourth-largest city and the capital of the Viovodship of Lower Silesia. Originally built across several islands the city still has many lovely bridges and beautiful architecture. Not far from the German border in the country’s southeast Wroclaw gets lots of German tourists who call it Breslau. The Rynek (central square) lined by colourful buildings is one of the city’s most popular destinations. The Cinque Terre is a string of centuries-old seaside villages on the rugged Italian Riviera coastline. In each of the 5 towns colorful houses and ancient vineyards cling to steep terraces fishing boats bob in harbors and trattorias turn out seafood specialties along with the Liguria region’s famous sauce pesto. Chefchaouen or Chaouen is a city in northwest Morocco. It is the chief town of the province of the same name and is noted for its buildings in shades of blue. Chefchaouen is situated in the Rif Mountains just inland from Tangier and Tetouan. Consisting of 400 restored buildings from the 16th- and 17th-century Spanish colonial period this area in San Juan is steeped in history with an old-world and romantic European charm. Hilly Nassau is the capital and largest city of the Bahamas. It lies on the island of New Providence with neighboring Paradise Island accessible via Nassau Harbor bridges. A popular cruise-ship stop it’s known for its beaches and coral reefs destinations for diving and snorkeling. It retains many of its characteristic pastel-colored British colonial buildings including pink-hued Government House. Relaxed beaches flank the sunny resort town of Menton known as “the pearl of France” and its most temperate locale. Nearly a dozen private beaches offer bar service and lounge chairs. The free public beaches are kid-friendly with plenty of aquatic sports to inspire a plunge into the Med. Reykjavik bears the distinction of being the world’s northernmost capital and for many Icelandic visitors it also serves as a gateway to the rugged adventure options beyond. Recharge after outdoor pursuits in one of the many geothermal springs or luxurious indoor spas. We appreciate Reykjavik’s open-minded and energetic culture that includes a hip and internationally recognized music and arts scene great food and notoriously “enthusiastic” nightlife. Just like the sailors of old you’d recognize this Venetian island by the picturesque pastel-colored houses and buildings visible from its shores. Burano also is famous for its intimate lace an art its people want to keep alive. Even if you’ve never been to this Cyclades island in the Aegean Sea you’d still recognize it immediately – candy-colored houses carved into cliffs sapphire waters gleaming white buildings topped with half-spheres the color of a stormy sky. Here you’ll find peace as you roam the black sand beaches or the streets of a provincial village like Imerovigli. Beautiful Oia is world famous for its sunsets which seem tinted with every shade of an artist’s palette. Aveiro is a city on the west coast of Portugal set along a lagoon called Ria de Aveiro. It’s distinguished by its canals navigated by colorful boats (barcos moliceiros) traditionally used to harvest seaweed. Not far from its core known for art nouveau buildings is the Cathedral of Aveiro with its prominent bell tower. The Museu de Aveiro housed in a former convent has a lavish tomb made of marble.